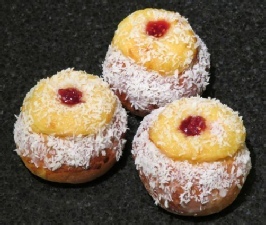 These buns are a traditional Norwegian children’s treat. This version adds a splodge of homemade raspberry jam to the classic custard-stuffed cardamom buns, topped with desiccated coconut.  Make the dough - melt the butter and add the cold milk, heat until tepid.  Stir in the yeast and sugar - leave for 10 minutes.  Place the flour and cardamom in a mixer bowl or hand bowl.  Mix in the yeast mixture and using the dough hook (or by hand kneading) work until the dough pulls away from the bowl.  Tip put on to a very lightly floured surface and knead for about 5 minutes, the dough should be smooth and not sticky.  Place in a lightly oiled bowl and leave to rise until doubled in size.  While the dough is proving make the custard by creaming together the egg yolks, sugar and extract. Add the cornflower. Heat the milk and cream to a simmer and pour onto the egg mix whisking all the time.  Return to the pan and stir until thickened, leave to cool.  When the dough is ready tip on to the work surface and lightly knead for a couple of minutes.  Roll into a sausage shape and cut into 12 equal pieces.  Shape into balls and place on a baking tray, leave to prove again for about 30 minutes.  Press down an indentation into the middle of the bun and fill with the custard, brush with beaten egg.  Bake for 20 mins until brown.  Glaze with the icing sugar glaze and dip into the desiccated coconut.